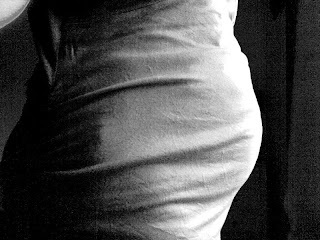 I have been asked several time by people what my bump looks like these days, and I apologise for having been shy with the photos. I freely admit I have been holding back, mainly because I am very aware that d'Alfiebump is not the perfect football shape of many a celebrity mum, but more of a kidney bean shape, which I suppose in a way is quite fitting for the slight oddity that is our family. Anyway, I have now recovered from my shyness and am fully embracing the wonky bump in all its glory. Thanks to one of my blog subscriptions, I was recently introduced to this manifesto for Idle Parenting, which I thought I would share because it absolutely speaks to me about what I want for our family in the future. One of the things that I have really struggled to get my head around in the last 5 months is quite how many people have diametrically opposed views on the “right” way to raise a child. It seems that parenting has become the new self help aspiration, and in the same way that there are millions of magnum opi on how to succeed in business, there now seem to almost as many of books on how to succeed as a parent, each of which attracts followers with an almost religious zeal. I suppose in a world where families are increasingly fractured and a lot of received wisdom is lost between generations then it makes sense that something would fill the void, but it makes me sad that it is one more area in which we as people have little faith in our own ability to work it out. Having read a few of the main players in the market, I suspect that we will take selected highlights from the routines of Gina Ford. Her approach seems to suite the kind of people that we are, it gives us a fighting chance of being in a good state by the time I need to go back to work, and it also means that Keith will have a structure to his day when he’s left quite literally holding the baby. That doesn’t mean that we will follow every letter of that book, because quite frankly that is also the sort of people we are, and as with all things, I truly believe that the value of these ‘methods’ is in giving guidance, rather than instruction. You take what you need to suite you and your family, and the rest of the time, well, see above. Week 21: Feeling Hot, Hot, Hot!! Last weekend we took a trip to Maldon for Bill's 30th birthday. As befitted the weather and the occasion we spent a lot of time out and about and down by the sea. Bill had spotted a fantastic spot for catching bass and obviously Keith was anxious to try it out for size. I decided that I might as well join them for the purposes of capturing triumphal moments, and generally lazing in the sun. 2. Sea breezes are deceptive in their cooling abilities. So despite the fact that I was crawling along, I managed to give myself the first in a series of funny spells which required me to kneel on the ground, kick me shoes out, stick my arms out like chicken wings and breathe calmly until my poor body eased itself back down from near boiling point. I was shocked if I'm honest, I really didn't see it coming. I've never had a funny spell like that before and the conditions, while nice and toasty, were nowhere near the sun baked temperatures I would have expected to cause my internal thermostat to wave the white flag. Even more surprising are the two other funny turns I've had since. One while sauntering along the water front the day after, and one yesterday after climbing the stairs with an armful of washing. I'm nothing if not indignant at this latest development which seems to be telling me that despite doing only a fraction of my usual activity, I'm still doing too much. Lesson learned, I shall be taking it easier from here on in. Oh, the other piece of news is that Alfie has found a new game. It's called "Let's trampoline on Mummy's cervix" and being honest, it's not my favourite of the little ankle biter's repertoire. Imagine if you will, a dramatic scene where some poor soul has fallen through some ice and someone is stamping on the ice trying to break through it to save their life. Now imagine that ice is my cervix and you might have an idea of how it feels. It was a bit of a shock the first time I felt it, but after a few searches on the web I found out I wasn't alone, which was reassuring. Luckily it isn't a common pass time, unluckily, Alfie appears to have impeccable timing. I was giving a training session in our video conferencing room yesterday when it occurred to me that my voice was uncommonly high and squeaky. Shortly afterwards it dawned on me that the reason for my Beaker impression was because Alfie had started his little clog dance again. I will state the obvious here, but it is not easy to train people in a calm and professional manner when all you can think about is the clip-clippety-clop on your stairs!!! Baby Bird, or Alien? You decide!! Of course Keith took the opportunity to claim that this photo meant that he should be allowed to re-grow his own moustache. I took the opportunity to point out that his moustache makes him look like a 70s throwback. Apparently though, this is a good thing. Well the day of the scan has come and gone, and some of you no doubt will be anxiously waiting for news of whether Maybe is in fact a tail, or a no-tail. Others of you perhaps just bored of the web and looking for something to read in the 5 minutes before you have to start work on that report you’ve been avoiding. I suppose it would be churlish under the circumstances to keep you waiting any longer. So I will tell you now .... it’s a boy ... or a very funny looking girl, there is always a possibility. The scan itself went really well once Maybe was dosed up with sugar. He was asleep on his tummy when we first arrived (which explains the location of the majority of the kicking!!) so they did a few measurements, all of which seemed fine. Then they sent me away to down a bottle of cola and walk around for 20 minutes to get him to turn over so they could finish the measurements and even tell us what flavour he was. After much jiggling around on my part, I finally felt him move. Unbeknown to me, he moved the wrong way so he ended up facing us, rather than on his back as hoped. 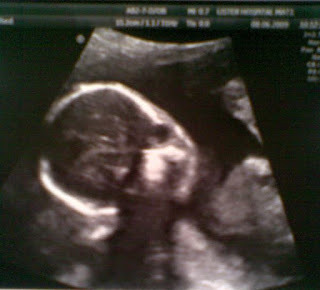 As a result when she put the dongle thing back on me we got a screen full of boy bits (so it was a good thing we wanted to know) and also a very scary photo of the face looking either like a baby bird (the sonographer’s opinion) or one of Geiger’s less attractive aliens (my own personal view). Had I not forgotten my phone this morning I would have posted the picture for you to make up your own minds, but that will have to wait. All measurements were on the small side of the normal range. He has long legs, a narrow head, and a skinny tummy barely there enough for me to blow a raspberry on!! So basically, it appears Alfie is going to be a carbon copy of his dad. Oh yeah, in case I’d forgotten to mention it to anyone, the boy Maybe is going to be called Alfred, or Alfie for short. Shall I start with the little updates, or the big exciting point of this update? Oh what the heck, the big exciting point has it. Maybe is now halfway to being born – can you believe it?!?! It is one of those strange feelings that you haven’t yet had a chance to get your head around the concept of being pregnant, while feeling like you have been so forever. I can’t remember a time when I enjoyed the smell of red wine, or could look at spicy food without wincing, or even went a whole day without patting my stomach after a particularly concerted bout of kicking. It’s crazy the way these things creep up on you. Anyway, my midwife appointment was on Monday and I am pleased to report that Maybe has a lovely healthy heartbeat of 134 bpm and growing as expected. Personally I am not so keen on that aspect because my bump has now gone from nice and neat to wildly odd shaped as Maybe pushes ever upwards rather than outwards. It’ll all be fine in a few weeks, I know it, but right now I’m heading back to the floaty end of the clothing spectrum. Another slight, and more literal hitch is my recently discovered shame at not knowing my own size. Anyone who saw Harry in his recent incarnation as a flower pot will know that despite several months of practice, the little lad never learned how wide he was. So it is for me. I actually got stuck in the car park at work the other day, much to my shame, and had to find an alternative route out. It’s a really odd feeling though, in my head I’m the same size I always was, it’s the rest of the world that has shrunk!! Oh and finally I have one small reminder about a very exciting event – only 5 more sleeps until our next scan!!!! Anyone wanting to register a guess at whether Maybe is a tail or a no-tail had better get their skates on! !